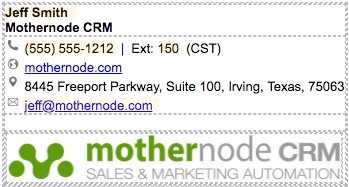 When creating standard emails to use within a Mothernode Marketing sequence customers will often want to personalize the email by adding a signature. This, of course, can be done but if the email template will be used by multiple users when emailing their contacts, then a dynamic signature is the recommended process. This process is ideal when setting the Contact Owner as the sender of the email. 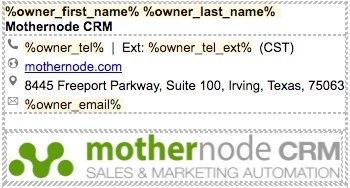 When using a dynamic signature Mothernode will fill in the holes with the correct data pulled from the user profile. What is a dynamic signature? Simply explained, it’s your standard company signature but rather than using the actual variables that make up the user’s identity, the signature is built using merge fields.